Now that we have the backstory for the writer’s guide let’s dig into the backstory of the show as created by this point in the season one guide. “These Are The Voyages” sets up the world the writers will be creating. Next week we’ll get into the early concepts for the characters (which will be expanded on later) but this week I’m going to focus on the similarities and changes between the original and the sequel. By this point in time Star Trek had only existed in two TV series, one created for Saturday morning, and a series of movies. (Novels and comics are not canon and while the SatAM cartoon’s canon status is debated I count it and some aspects did make their way into the show and spinoff media.) In fact the movies were still going on as The Next Generation was airing. All we really knew at the time was that the show was set after the original crew, but the writers and directors needed to know more than that, and so this section was to update creators who grew up with the original series what they would be doing differently in this updated approach. So what was planned? So trying to organize around stardates is a waste of time since it means jack all when it comes to the continuity. I’m guessing this is a sample stardate noting an extra decimal to represent being a century later. A quick skim of this guide didn’t reveal any discussion on stardates but we can assume the trend continued. This is followed by the “ship’s mission”. That’s not the show’s opening, which they do write just before this section, but about Enterprise‘s mission statement. To expand the body of human knowledge. To provide assistance as required to Earth/Federation colonies, commerce, and travelers. To provide for Earth/Federation security. To seek out new lives, new civilizations. And yet if you watch season one often the point was to show up and show how much better they were than the other civilizations. They never really learn anything. They show a respect for life but they could be a bit smug at time. Go watch SFDebris’ reviews of season one episodes and you’ll see what I mean. And I need to do that to familiarize myself with the series since only BBC America currently airs it and I don’t know when they’ll get to season one. I might be exaggerating, but only slightly. Remember, Gene envisioned this would be a time where we all got along without problems and even death got a “just a part of life” shrug despite stories about trying to save lives and help others. And money was done away with as part of Roddenberry’s utopia. I always find it funny that people who make more money in an hour than I have in my life are trying to tell me how evil money is and that we should all go back to the barter system. Especially from the guy who added “lyrics” to the original show’s theme song just so he could get a share of the royalties. 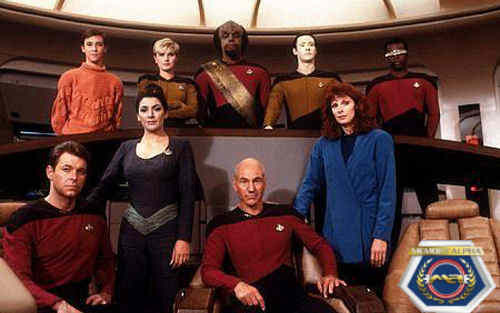 From there we move to more about the lore as of the TNG time period, a period that would later include two other shows. It notes that this show takes place in the 24th century, seventy-eight years after “…the time of Kirk and Spock”, who are now considered legends. Except we see Spock is still alive years later and Kirk would also show up…but we won’t get into that here. It also notes that Kirk and friends didn’t so much “explore strange new worlds” as chart them, meaning even in known space the Federation has claimed (with a giant flag in the middle of the sector I like to imagine) there are still things to explore. I do remember hearing that they weren’t so much pushing out into the galaxy as going around the area they already charted, which the guide still says is roughly 19% at the time. I ended up saying more in this section than I thought I would. I’m already over 1000 words, so we’ll end here. Next time what has and hasn’t changed between shows according to this guide? We’ll get our answers then. Posted by ShadowWing Tronix on August 3, 2018 in Star Trek: The Next Story Bible and tagged Star Trek: The Next Generation, story bible.